As if the 2014 Honda Pilot weren’t good enough already, Honda has given drivers another option when looking for one of the most popular SUVs in Central Illinois. 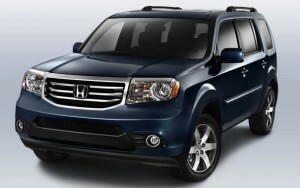 The 2015 Honda Pilot will have a new mid-range trim level available, the Pilot SE. What sets the SE trim level apart from the rest? Let’s take a look! With four trim levels, the 2014 Pilot has often had drivers struggling to decide between the EX and EX-L trim, and we can’t blame them. There are some nice features on the EX-L, but it’s easy to understand that some people are more interested in what the EX has to offer. Thankfully, Honda saw that middle ground and put a brand new trim level there. Of course, drivers can still enjoy all of the great standard amenities from the current model as well, including Bluetooth, a rearview camera, Honda’s infotainment system with touchscreen, and more. If you want to get an idea of what you can expect out of the 2015 model, we invite you to take a test drive of the 2014 Honda Pilot today. Just visit a Central Illinois Honda Dealer and let one of our sales team members put you behind the wheel. We think you’ll agree that it’s one of the best SUV choices around.